Growing up with a filmmaker as a father led to all sorts of fun on and off set adventures, but photography was not really one of them. 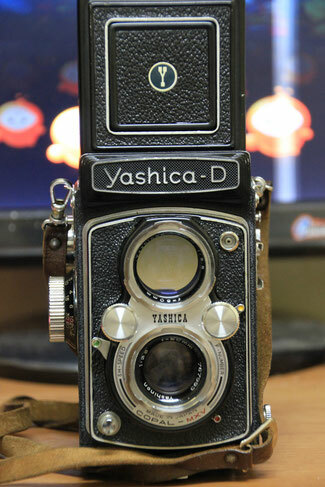 At some point my dad gave me a Yashica-D TLR camera and tried to teach me about things like f-stops, but I remember not being very sure what it all meant. I do remember taking a picture of a flower in my Grandmas garden, and even making a print in the garage darkroom. When I got more seriously into photography in 2016, I was quite happy to have a digital camera and the idea of using film did not really cross my mind. In May of 2017, I had the idea to try and recreate some 1940s stile Hollywood glamour portraits, and my boss asked if I had considered using film in addition to digital. As he is an enthusiastic analog photographer himself, he offered to bring along a camera, and we could try it out. It was an interesting experience, but I still wasn't convinced that I would like analog photography.